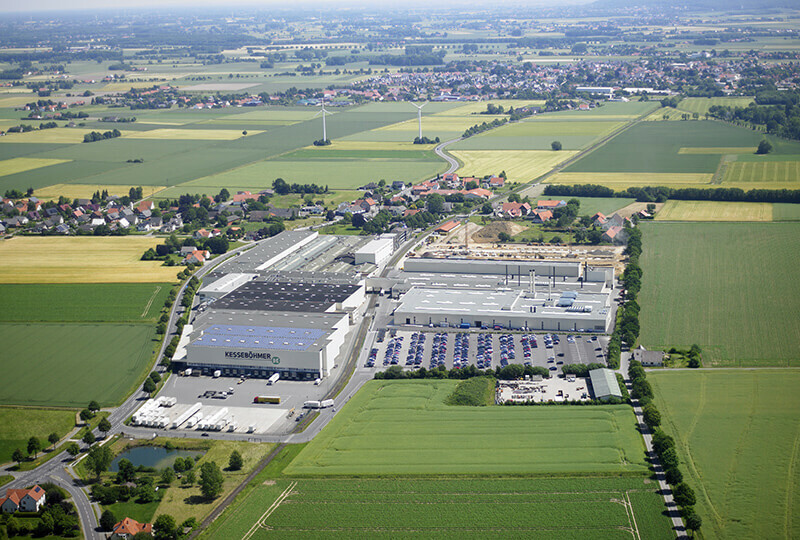 Kesseböhmer has invested in its headquarters once again. 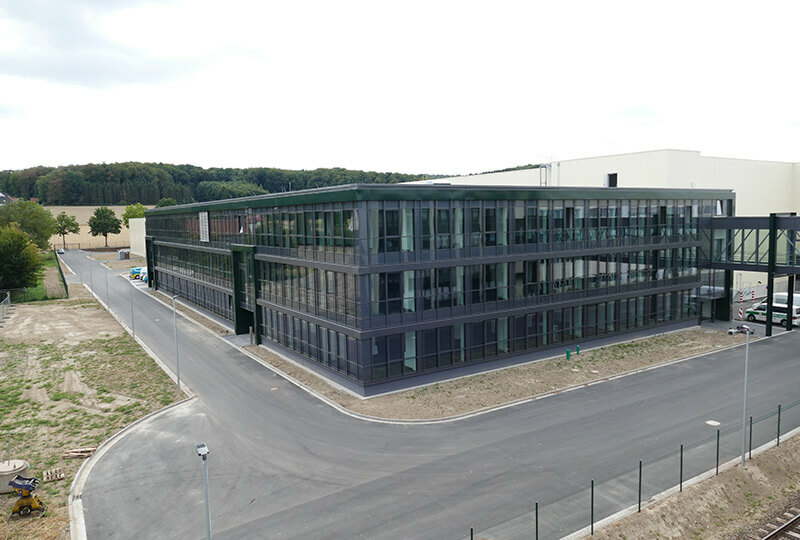 A new building complex totalling about 24,000 square metres has been under construction since 2017 on the company grounds in Dahlinghausen, Bad Essen. 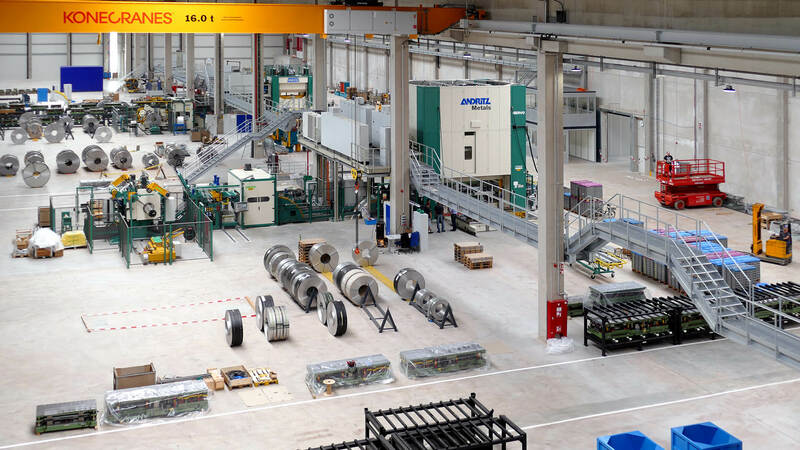 The new punching and pressing plant with its four production halls and warehouses takes up 20,500 square metres of this and new offices have a further 3,500 square metres. According to the firm’s owner, Oliver Kesseböhmer, the company has invested mid-double-digit millions. 150 new jobs will be created in the latest expansion phase. 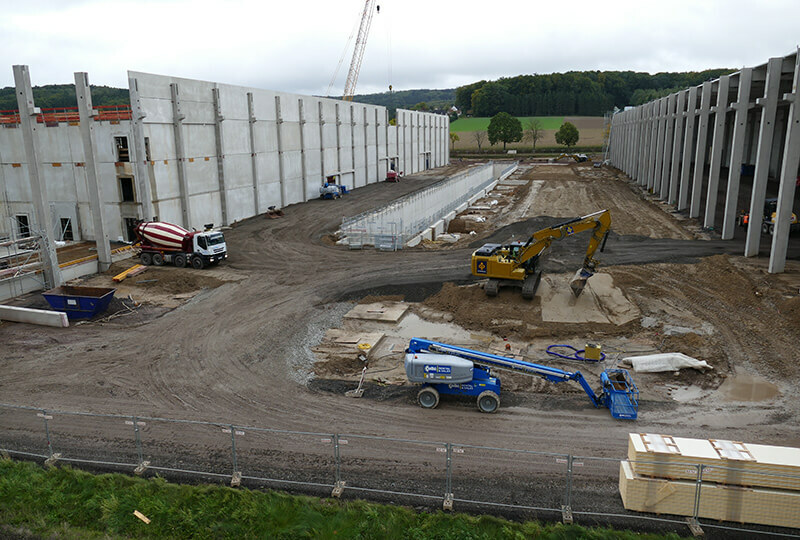 Building site at Kesseböhmer in Dahlinghausen. 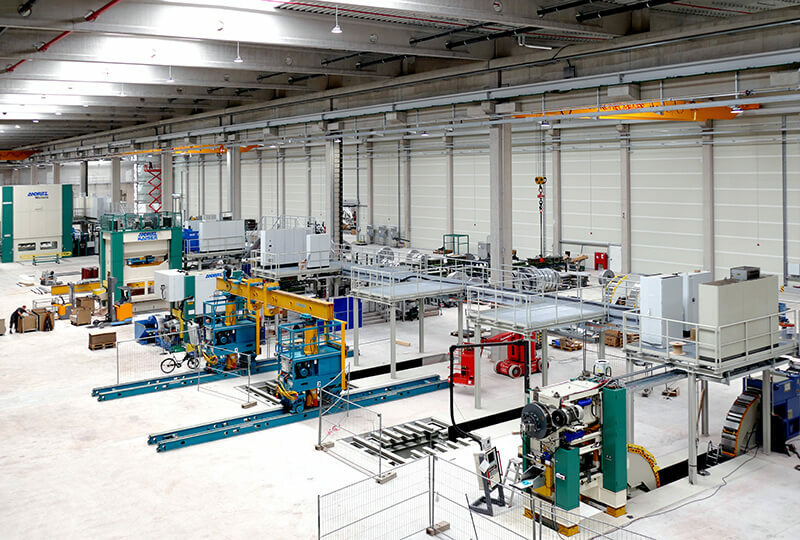 The new punching and pressing plant at Kesseböhmer in Dahlinghausen. The figures published by the general contractor, Depenbrock Bau, Stemwede, illustrate the dimensions of the project for which about 348,000 cubic metres of enclosed space was created, 40,000 cubic metres of soil were moved and 700 prefabricated reinforced and prestressed concrete parts were used while 15-metre long and 2.5-metre tall prefabricated reinforced concrete girders were used for the support structure. A 400-tonne mobile crane was used to install the heaviest 85-tonne prefabricated girders. The centrepiece of the construction project was a seven metre deep and 150 metre long punching basement, from where punched parts can be transported away directly. 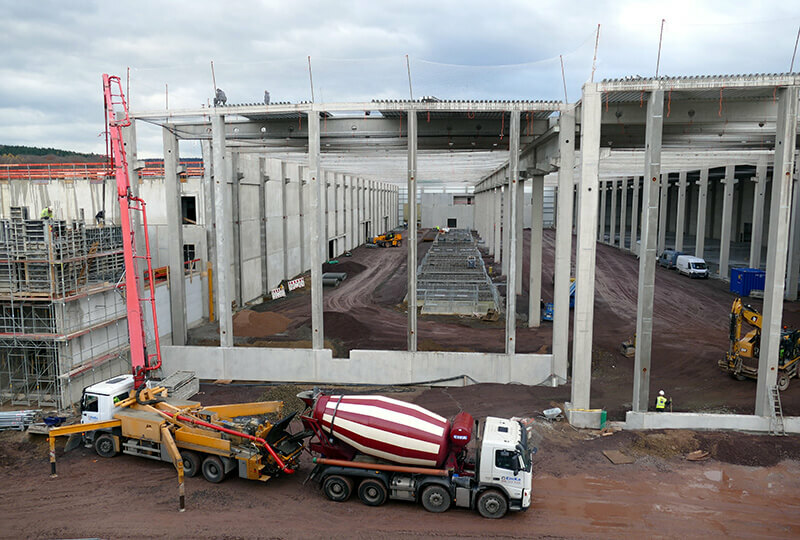 The up to 1,000 tonne heavy presses stand on an industrial floor with a high load capacity – removable, 50 centimetre thick concrete slabs – with thermal activation; they allow the halls to be heated across 20,000 square metres of space at the same time. It was also important to implement strict requirements regarding vibration and noise protection in the structure. As a result of the enormous size of the hall and therefore of the sealed surface, it was necessary to find new ways to drain rainwater. A 920-metre long channel was created for this purpose. 40,000 cubic metres of soil were moved. Aerial view of the building site at Kesseböhmer in Dahlinghausen. 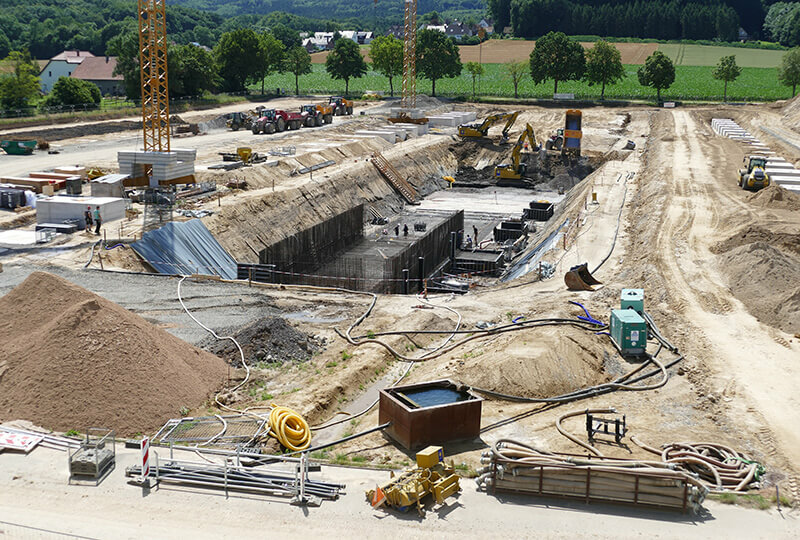 Building site at Kesseböhmer in Dahlinghausen. Easy to see: the seven metre deep and 150 metre long punching basement. The roofing ceremony was celebrated in June with 1500 employees and guests. 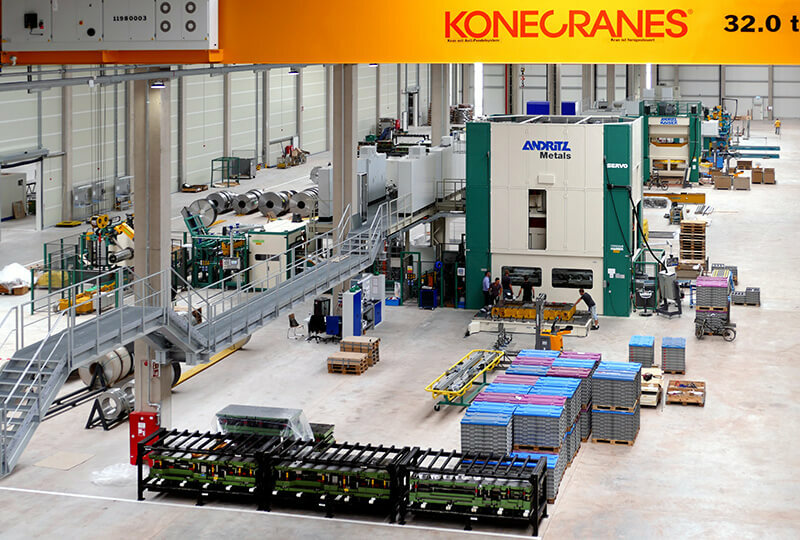 he new punching and pressing plant at Kesseböhmer in Dahlinghausen. 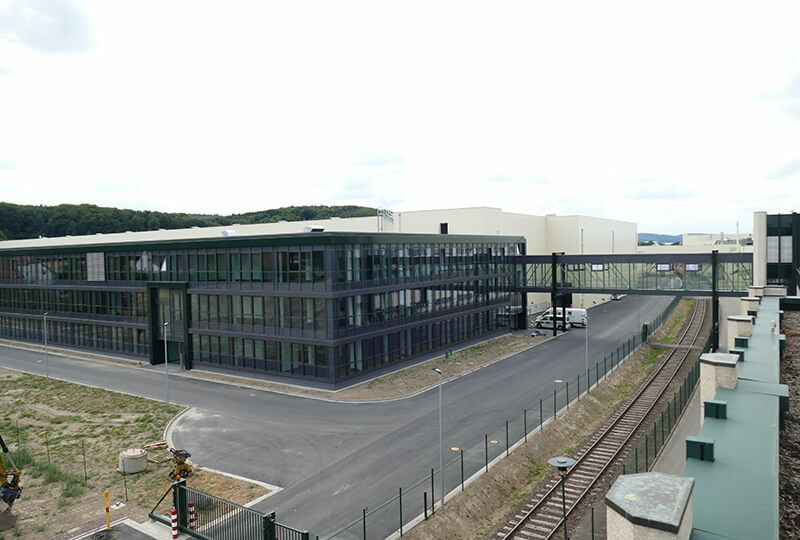 The new office building at Kesseböhmer in Dahlinghausen.